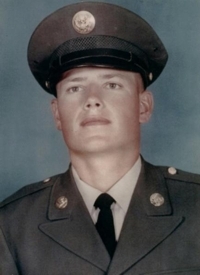 OLIN — Specialist 4, Dennis Lynn Ahrendsen, lost his life while on a reconnaissance mission in Vietnam on Friday, Sept. 6. Family prayer service was held at St. Paul's United Methodist church, Olin, on Tuesday, Sept. 17, at 11 a.m. Memorial services were held in the high school auditorium, Olin, at 1:30 p.m. Rev. Lloyd Dutro conducted the services. Military rites were in charge of Blayney, Mirier post. Interment was in the Olin cemetery. Pallbearers included Merlin Fredrichsen, Robert (Tim) Timmons, Gene Pauli, Kevin Clark, Robert (Butch) Graf and James Abbott. Mrs. Leon Stivers was organist. Mrs. Hans Ahrendsen, Oxford Junction, was soloist. He was born Nov. 23, 1946, son of Norman and Marjorie Schellin Ahrendsen, at Anamosa. Dennis grew to manhood on his parents farm northeast of Olin where he shared in the farming operation and was active in 4-H work and activities. He attended the Olin school where he graduated from high school in 1965. Following graduation from high school, he attended Iowa State university, Ames, for one and one-half years. On Aug. 9. 1967, he was married to Sally Cruise in St. Paul's church, Olin. He entered service in the United States army on Oct. 18, 1967, and had been in Vietnam since March 27, 1968. Dennis was a member of St. Paul's United Methodist church Olin, where he had been active in the Sunday school and church, serving for several years as an usher in the church. Survivors include his wife. Sally, Cedar Rapids; his parents, Mr and Mrs. Norman Ahrendsen, Oxford Junction; a sister, Sheryl, Mrs. Dean Wood; Olin; and a brother, James Ahrendsen, at home. He is also survived by his paternal grandparents, Mr. and Mrs. August Ahrendsen, Olin; his maternal grandmother, Mrs. Carl Schellin, Anamosa; five nephews; a number of aunts and uncles; other relatives and friends.